Even though job growth is steady in California, the state still faces rising income inequality and high levels of poverty. To spur action against these persistent problems, the second day of the 2016 California Economic Summit opened today in Sacramento with restoring upward mobility taking center stage. For the more than 500 civic, business and thought leaders who attended the Summit, the way forward takes the form of the One Million Challenges: building one million more homes, training one million more skilled workers, and capturing and saving one million acre-feet of water over the next decade. At this year's Summit, co-presented by CA Fwd and the California Stewardship Network, the first discussion of the day focused on how Californians should address future employment opportunities, especially in areas that have populations with low education levels and a dependence on low-skilled work. The Inland Empire is one of those areas. The region is experiencing population growth due to lower housing costs and job growth in goods movement, said panelist Paul Granillo, president and CEO of the Inland Empire Economic Partnership. But, he added only 20 percent of the residents have a bachelor’s degree a problem that grows as technology alters workforce needs. The second panel on state's workforce benefited from having leaders representing all three of California's higher education systems, plus the president of the California State Board of Education, Michael Kirst. The session focused on the challenge of producing one million more graduates with bachelor’s degrees and one million more middle-skilled credentials to fill the jobs needed in the emerging industries. 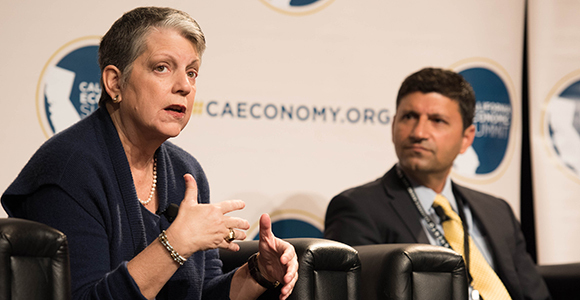 University of California President Janet Napolitano had some good news about how California’s higher educational system is built and how it can help contribute to the success of the challenge. Loren Blanchard, executive vice chancellor for Academic and Student Affairs for California State University system, added that many students coming out of CSUs have an advantage over other graduates because 61 percent of them do not pay tuition (they have scholarships and grants) and 50 percent graduate debt-free. “When we talk about social mobility, that is the lynchpin,” said Blanchard. "They can move out of colleges and universities and into the workforce." The Summit will assist communities and regions to strengthen student-focused strategies and tools to help all students chart a path to employment, whether they are seeking certifications for skilled jobs or profession-oriented bachelor’s degrees. The Summit will work with institutions to develop new tools, technologies and practices that will allow employers to inform curriculum and programs to increase the value to students and develop a system of continuous improvement. California needs to encourage innovations that reduce time to completion and lead to meaningful employment. To protect this year’s investments from budget cuts in the next recession, the Summit will develop a strategy for long-term funding stability by leveraging existing funds, documenting value and results and committing to continuous improvement. In the past year, the Workforce Action Team found success with a $200 million investment in the Strong Workforce Program, a career technical education funding and coordination initiative and extension of the Higher Education Innovation Award. Now the team’s job will be to maintain that momentum in 2017 and make sure California's regions and employers are engaged with upgrading the state's workforce pipeline.